Foundation Capital is a 20 year old Venture Capital firm in San Francisco that are investors in Responsys, AdRoll and TubeMogul among others. According to partner Joanne Chen, we are entering the decade of the CMO and she identifies six keys to unlock CMO potential. The explosion of media channels, changes in consumer behaviour and the erratic path to purchase have created opportunities to make marketing more efficient through technology. In the next ten years, CMOs are forecast to spend more than CIOs in technology and their expenditure is predicted to increase ten fold to $120 billion globally. In 2015, technology represented one per cent of this total spend. It’s predicted that by 2025, technology will comprise 25 per cent. According to Chen, they don’t differentiate between marketing technology and advertising technology. Both are ultimately controlled by the CMO. We’ve certainly seen this reflected in the growth in marketing technology start-ups. 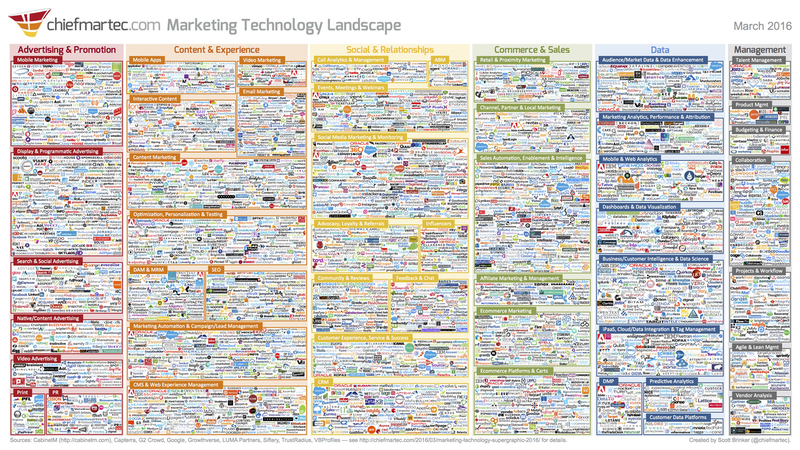 In 2011, there were 150 marketing technology start-ups in the US. In 2016, this number has increased to 4,000. In the perfect world of the future, CMOs will understand the ROI for each dollar spent, for each campaign across channel and what that drives in business impact. This is no easy problem. If I buy a pair of Nike shoes on Amazon, I may walk into a store, see someone else buy a pair, admire my friends newest pair and eventually decide to buy my own on Amazon. How does Nike attribute this purchase and find out how much they spent on me as an individual to drive this behaviour? Data is the main problem and it’s tricky to unify these data points to a singular person when we live in an online and offline world. There is still a large proportion of time when marketeers have no idea what consumers are doing. According to Chen, CMOs want to buy advertising programmatically. She predicts we will move to more of a stock exchange model but there is still a little way to go in improving transparency and the fact that agencies still largely lack skills to work in the world of software. Hiring the right talent will be key. Traditional advertising has been largely push advertising. Ads annoy people, especially younger generations and it’s getting easier to avoid advertising with ad blockers and on demand TV. Content is far more powerful in the new world and the future lies in the ability to deliver relevant content that is interesting to an individual, at the right place at the right time. Chen predicts all brands will use content marketing in their marketing and the main challenge is creating content at scale, across formats that’s relevant to the audience. To achieve scale, technology or machines are going to be instrumental and there’s no one really solving that problem yet. Once the content has been created, the distribution and measurement of this content will also be important. It’s widely accepted that mass personalisation is the future of marketing but this is still expensive to do at scale. There is insufficient data today on how customers interact with brands and even when that problem is solved, there’s still a need around creating content that can be personalised and scaled. Not to mention concerns around privacy. Marketing will evolve from playing a demand generation role to becoming a real driver of revenue and growth. Marketing will have increasing responsibility over sales where sales just becomes order-taking. The biggest change in the last 12 months is the way that media has evolved from linear TV to streaming video. And we’re seeing a shift in the way that video is distributed too with Snapchat, Facebook and Virtual Reality (VR). CMOs have to think about the development of cross-platform video and a VR strategy and blur the line between content and advertising. That’s hard. Scalable, personalised video content is difficult. However we are starting to see progress in these areas. Perhaps the solution to creating personalised video could be Virtual Reality (VR). It gives power to the consumer to choose what they experience. Chen recently produced her wedding video in virtual reality. She thinks her children will think that’s normal. Just last month, Twitter began live streaming TV in the US with deals signed with NBA basketball, NHL hockey and college sports. They are also live streaming the US Presidential debates. Watch this space.